Have you noticed that we haven't been sending our newsletters as frequently as we used to? Today you will get a glimpse of what we've been doing this summer season. If you are a fan of frozen yogurts as much as I am, you will appreciate some of the ideas behind these new brands we've been creating together with our clients. 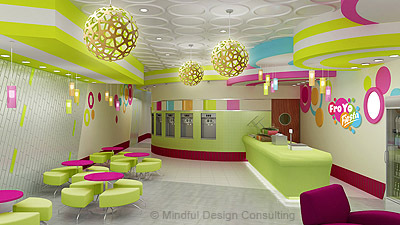 Take a look and tell us which yogurt shop design ideas you liked the most. If you have questions about your interior design needs, you can always e-mail us or simply fill out this form to start the conversation. In our Green News corner, I would like to share some current capabilities of 3D printing. 3D printing is becoming a more familiar term in our lives. There are companies which already started printing houses that take approximately 24 hours from start to finish. Take a look at these beautiful lights also printed by a simple 3D printer. If you missed our last month's newsletter on Some of the Most Stylish Light Fixtures This Season, take a look HERE. 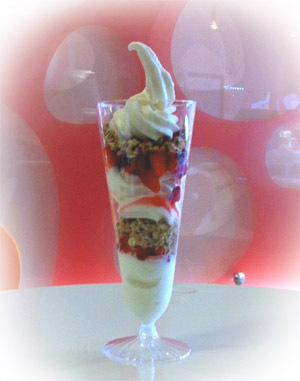 On the right: A picture of this yummy fruit and granola parfait at Apricato Yogurt Shop was taken in front of a custom made acrylic wall panel, designed specifically for Apricato brand. 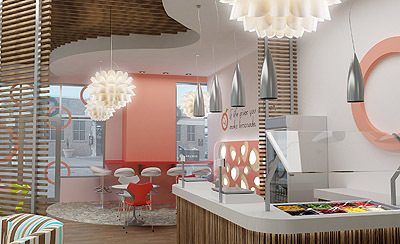 Apricato was one of the first yogurt shops we designed in the US. And we will always have that special "newborn" feeling towards this fun project. Manoj and Meena Chopra, owners of the store, came to us wanting something unique and attractive to all ages. They also wanted to break away from the common colors schemes of other widely spread yogurt brands. Together with the help of the owners we accomplished that wish! Next month Apricato is opening their 2nd location after only a few months in business. Congratulations! See more images of Apricato Yogurt Shop HERE or like them on Facebook HERE. FroYo Fiesta Yogurt shop is a party place! Festive atmosphere was in the concept from the start of the logo design and all the way through designing the uplifting interior. Glass tiles were specified for the walls to make the place glow under bright cheerful lighting fixtures. The whimsical lights by David Trubridge blend really well into this interior. We hope to see FroYo Fiesta store open its doors soon! To see more images of FroYo Fiesta click HERE. 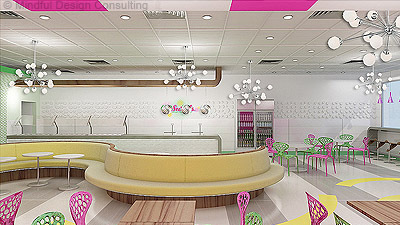 This Canadian Yogurt Shop brand CC Swirls is in a process of opening 3 locations within only a few months this year. Mindful Design Consulting helped to create an interior of this sophisticated store chain. Decorative panels by WallArt look fantastic as a backdrop for the bright colors of other interior elements. 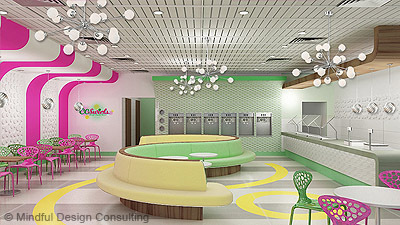 Swirly bench at the center leads yogurt lovers toward the machines on the back wall and offers a comfortable soft seating. Possini Opal Glass Pendant Chandelier is a great complement to this clean classy interior brand. 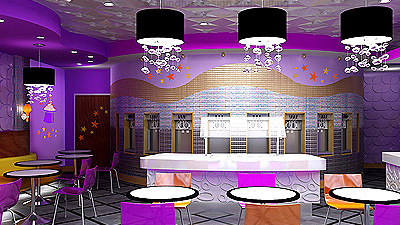 See more images of CC Swirls Yogurt Shop HERE. This yogurt shop is all about experiencing the Magic of Yogurt! It's almost like entering Alice in Wonderland's dream when you enter Magical Yogurt Shop. Possini Bubble Cascade Pendant Lights are complemented by ColorGlitz iridescent glass mosaic wall tile. Decorative panels by WallArt on front of the counters add a creamy texture to the overall ambience. We can't wait to see this store open up within a few weeks! 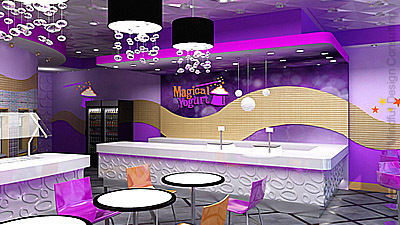 See more images of Magical Yogurt Shop HERE. Yogopolis is definitely a unique yogurt store concept specializing in healthy Greek yogurt. All the colors and materials selection was influenced by colorful architecture and scenery of Greece. Ivanhoe™ Dino Porcelain Cord Pendant Light in light blue color made an excellent addition to this color scheme. Who wouldn't want to visit this place and try some real Greek Healthy Yogurt? 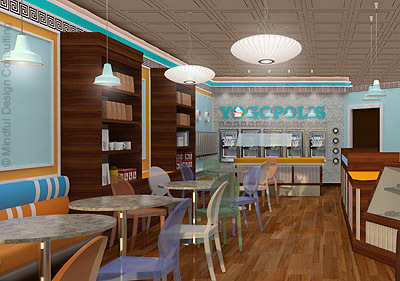 See more images of Yogopolis Yogurt Shop HERE. Like Yogopolis on Facebook HERE. 3D printing technologies have great potential to change the design field - from the possibilities of hyper-customization on the user end - to how it will revolutionize production. 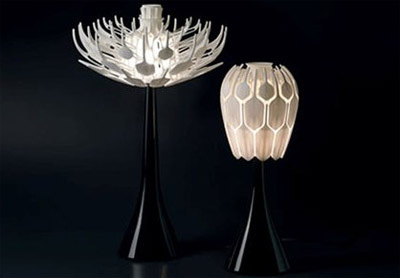 Case in point, it makes possible complex designs such as this striking, flower-inspired lamp - which is amazingly printed as one piece, including the hinging mechanisms that allow it to expand or collapse. Read more HERE.